This is John Johnston aged 84 relaxing in the sun at the Gate house on the Randalstown road in 1935 and enjoying a puff on the pipe. 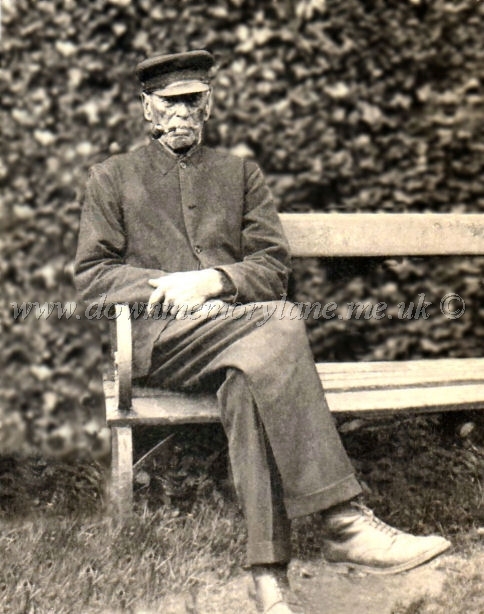 In his younger day he was the gamekeeper up at Tardree when it was part of the Antrim Castle Estate. 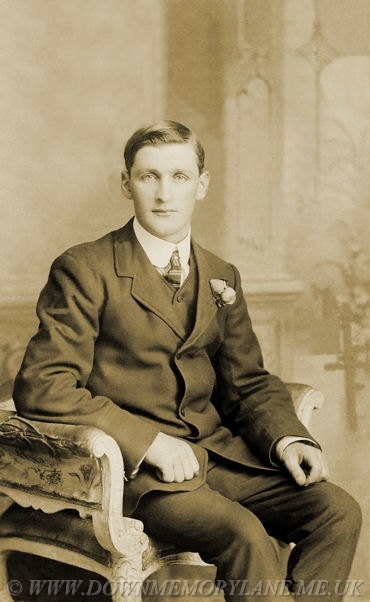 Later in life he was put in charge of the utilities at Antrim Castle such as the water and gas, for by then they were using gas to light the lamps. 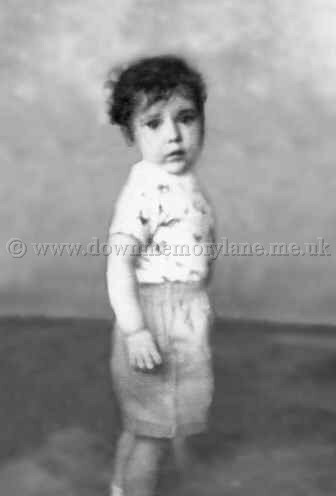 This delightful wistful little girl from Antrim is none other than Jackie Jenkins back in 1962.
getting an extra photograph taken of just them. 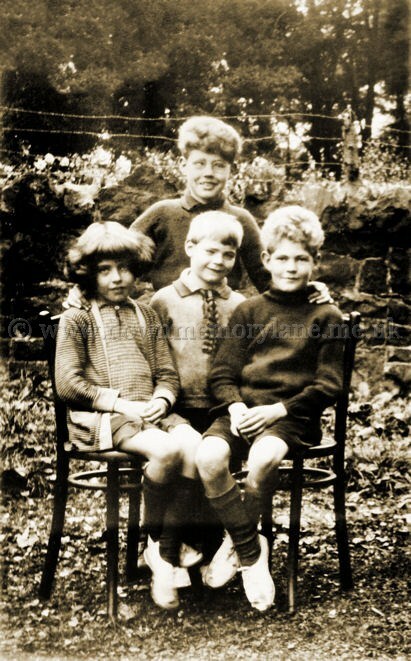 These are the Jarden children who at Bloomfield house in Fountain Street, Desmond, Eric, Billy and Annie. 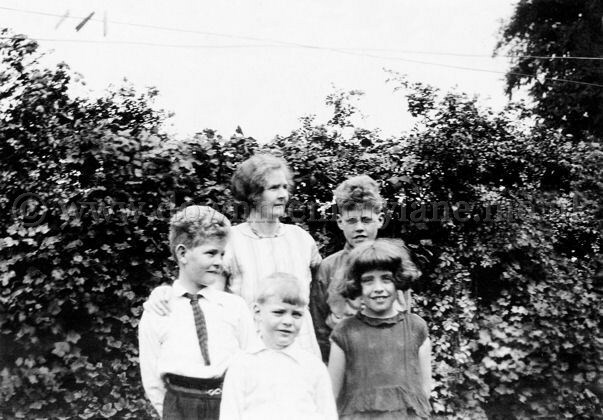 Here in their back garden at Bloomfield house in Fountain Street, the Jarden children, Desmond, Eric, Billy and Annie are having their photograph taken. Behind them is the clothes line and on it are the old long wooden pegs. 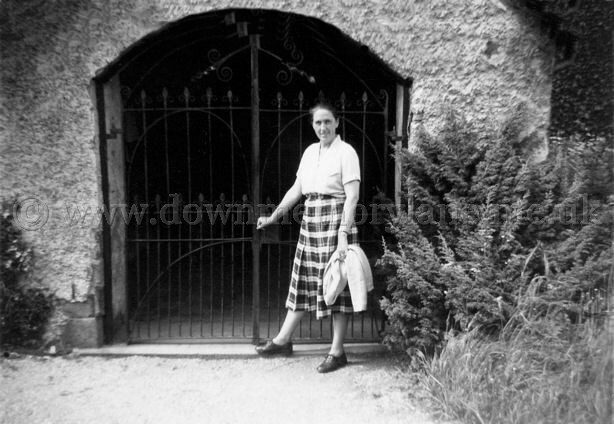 This is Jane back in 1956 having her photograph taken at these gates. Now can anyone tell me, her last name and where Jane was that day? This is the Jenkins' family and from the left are Margo then their mother Bridget and Hillary. 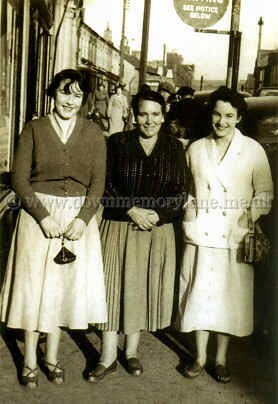 They have come from Antrim to Ballymena to do what all ladies like to do Shop! 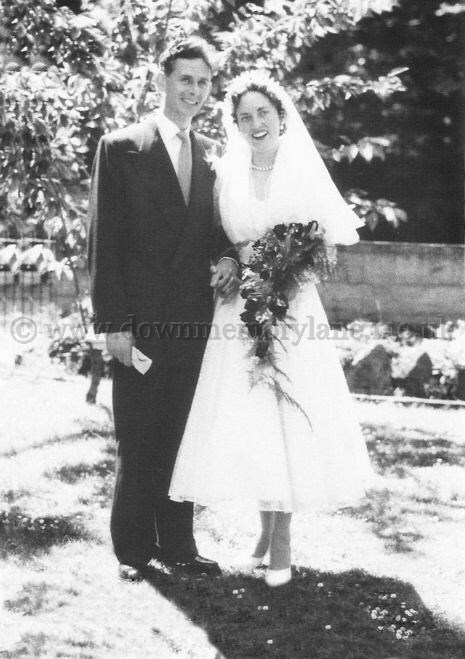 It's not only a beautiful sunny day but a memorable one for this happy couple after their Wedding in Antrim Parish Church on the 9th July 1955. The happy Groom is Roland Jones and his Bride who captured his heart is May Jones nee Fleming. 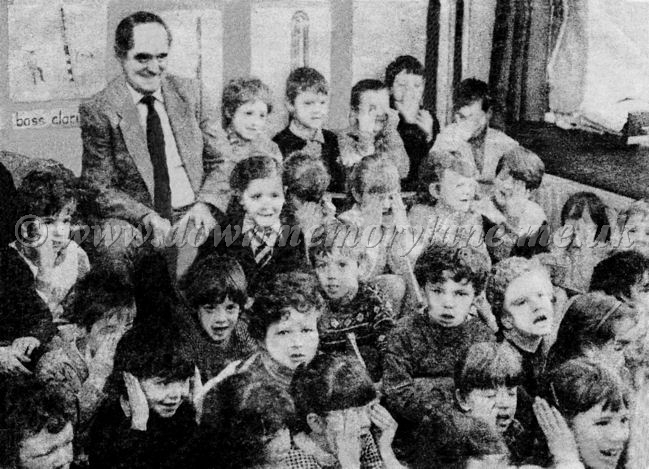 A bit too big for St. Joseph's Primary School Music department is the then Minster of Education Dr. Brian Mawhinney who was visiting the school. Now if you recognize yourself please let me know. 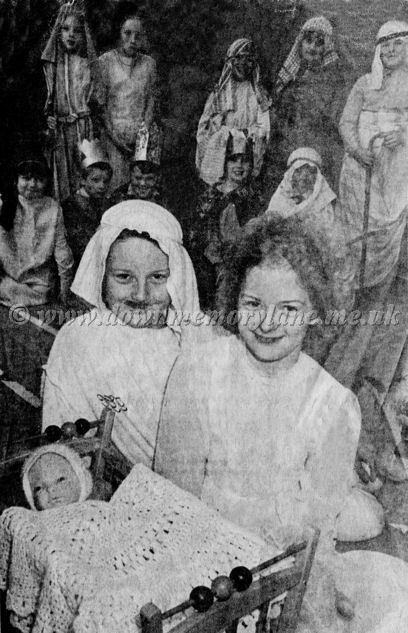 All smiles during rehearsals for their nativity play are Darren Waring (Joseph) and Joanne McLean (Mary) and behind them other members of the cast. 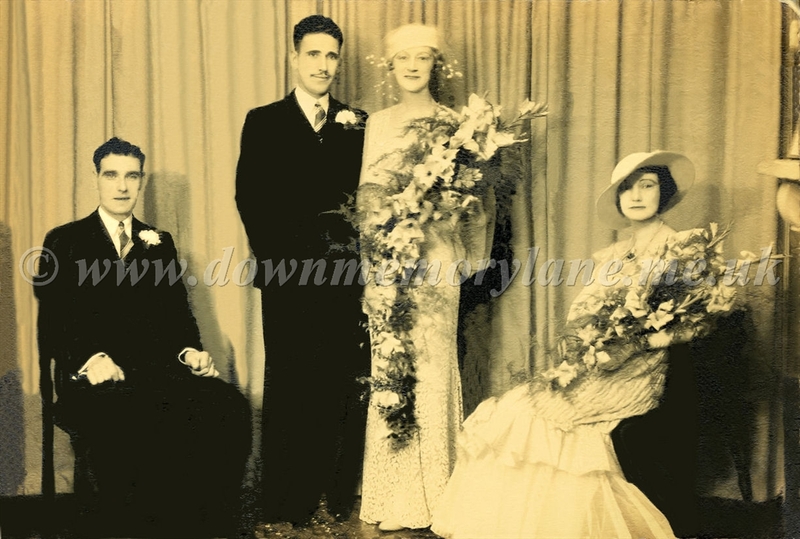 What a beautiful Wedding photograph definitely the Groom and Best man are only extras, this could be Hollywood instead of Antrim in the 1930's. also 'Natural Grace'. They are named for the shape of their leaves, gladioli  from the Latin word gladius, meaning sword, symbolizing strength and moral integrity, gladioli also represent infatuation, with a bouquet conveying to a recipient that they pierce the givers heart with passion. postcard which he didn't post. On the back in the address section he has written " To Miss Kelly" and on the communication side Jim has written, the first word is squiggle and can't be made out but the rest is" you know your-self From Jim". Now that's a cryptic message and no mistake. 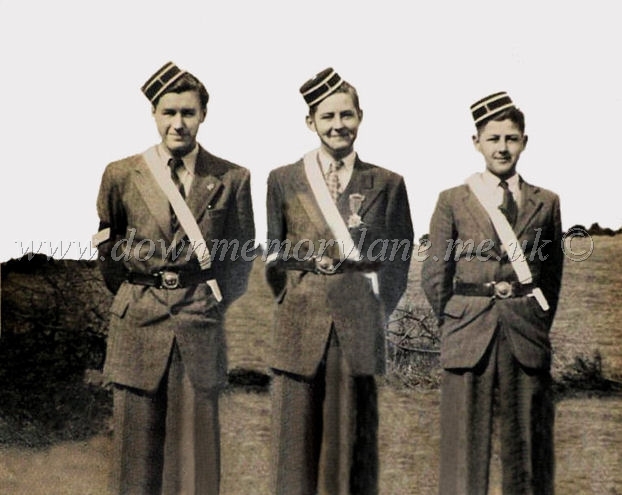 This is a 'Band of Brothers' the Johnston's and they belong to the 1st Lylehill Boys Brigade. From the left we have Reggie, George and finally Drew. This amusing farmyard scene was taken at the Jackson farm, Nib lock. 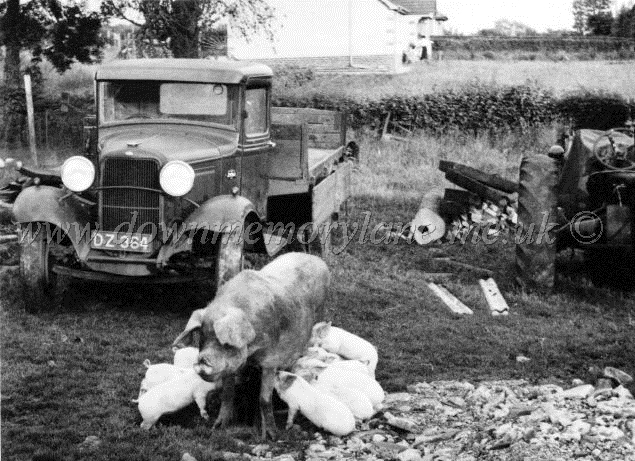 Just look at the lorry in the background, straight of Walton's mountain and dear help the pig not a minutes peace also the year is unknown. 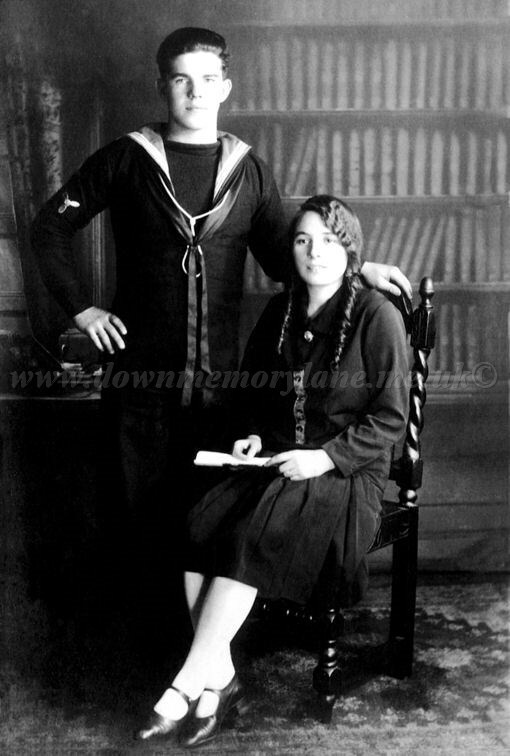 This portrait photograph is of Jack and Bridget Jenkins on their wedding day in 1929. Seated on a true mini at the side of the road is Meta Johnston nee McCabe. 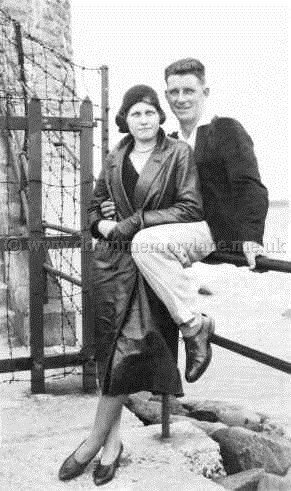 Meta was returning home from Dublin to Antrim with her husband where they had spent their honeymoon.